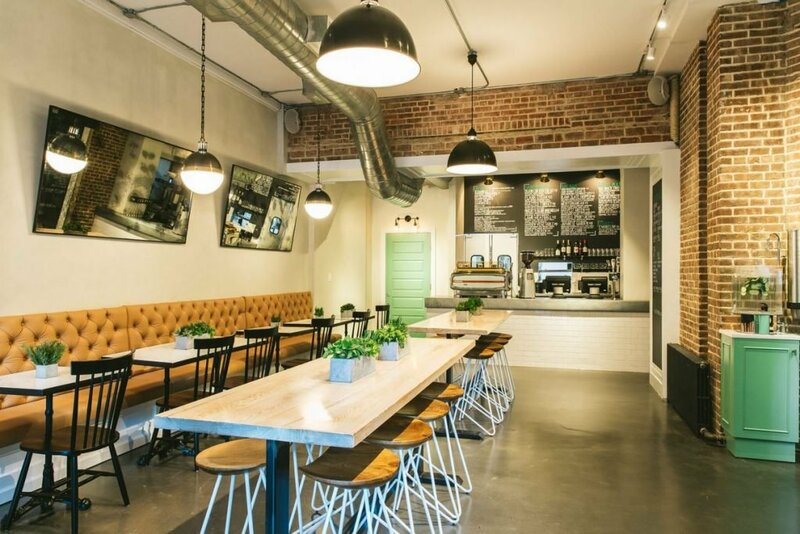 Designing a restaurant requires attention to detail, creativity and sometimes, a little customization. 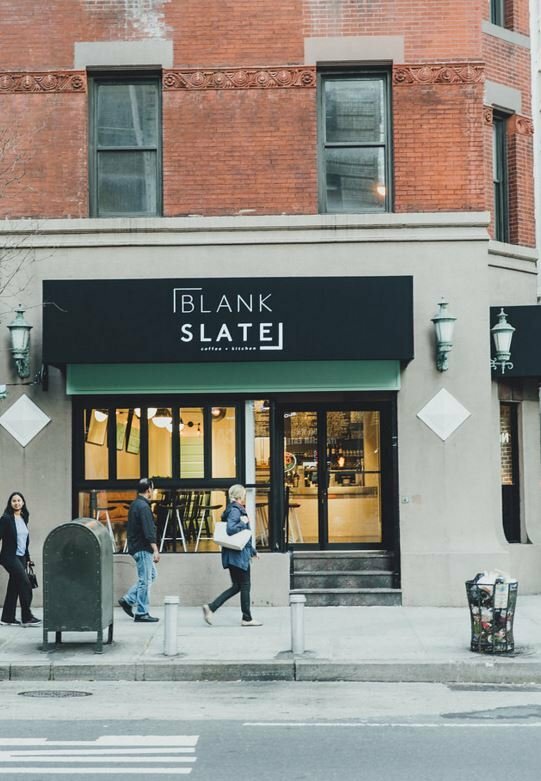 Recently we were privileged to work with BLANK SLATE, a café, coffee bar and marketplace offering sandwiches, salads, small plates and more. Drawing from the old to create something new, the result is something truly unique. 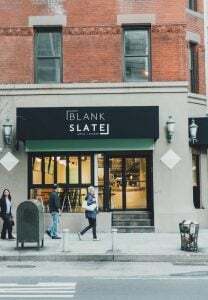 Just a few months ago, Blank Slate was literally that, the perfect opportunity for owners, Ashley Jaffe and Zach Israel, to create the café and kitchen of their dreams. 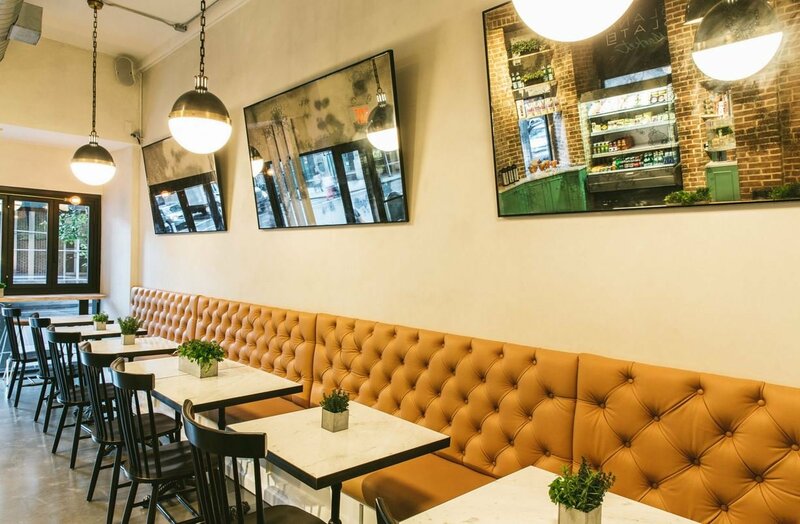 Located on 121 Madison Avenue, “We wanted to evoke an extension of someone’s living room… a place where people wanted to just cozy up with a cup of hot chocolate and stay.” says Jaffe. Dedicated to their vision, the couple chiseled through 6-inches of plaster to unearth a beautiful brick wall, worked with designer Lauren Mabry of Hunter Mabry Design to create a comfortable yet efficient floor layout, and had the furniture custom made. “The key was placing the right pieces throughout the space,” explains Jaffe. It was that search that brought Blank Slate to Olde Good Things. There, Jaffe shared her thoughts with Jim D, of 149 Madison Ave. “She looking for mirrors that seemed as if they were floating in their frame,” he shared. Wanting to guests feel most comfortable, Jaffe didn’t just want any mirror. “I wanted antiqued glass,” she specified. Working on a tight timeline, samples of hand-silvered glass were sent from the warehouse in Scranton for Jaffe’s review. Searching for the right amount of distress, the second round hit the mark and the team designed patonated steel frames to create a floating effect. Jaffe was pleased and the designers made another suggestion. “I sent my marble tabletops to Olde Good Things and they were framed in darkened steel as well,” says Jaffe. That same metal formed legs for two high-top communal tables handmade out of old growth oak. Harvested from very old oak trees that fell after heavy rains and extreme winds, the resulting wood is dense and extremely durable. Available in multiple finishes, Jaffe picked a smooth top with a driftwood finish. The entire process for Blank Slate took about six weeks. The result? …Timeless. To design, and build with Olde Good Things, contact us HERE. Photos taken by Sasha Israel Photography. Blank Slate website found HERE. Website for Hunter Mabry Design found HERE. To find about our hand-silvered antique glass, click HERE.